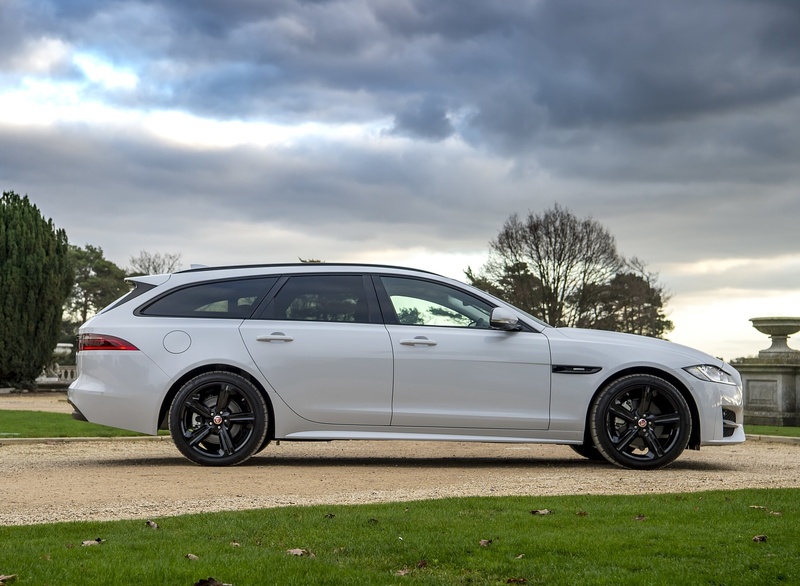 Special edition 300 SPORT joins the XF Sportbrake range for 2019 model year, powered by new 300PS 2.0-litre Ingenium petrol or 300PS 3.0-litre TDV6 diesel engine. The 300 SPORT comes in choice of three exterior colours. Features exclusive Dark Satin Grey design accents and 300 SPORT grille and bootlid badging. Special model features unique interior design elements including contrasting yellow stitching and 300 SPORT badging. State-of-the-art Touch Pro technology with 10-inch touchscreen fitted as standard. Upgrading finishes now available as standard for a more premium feel. 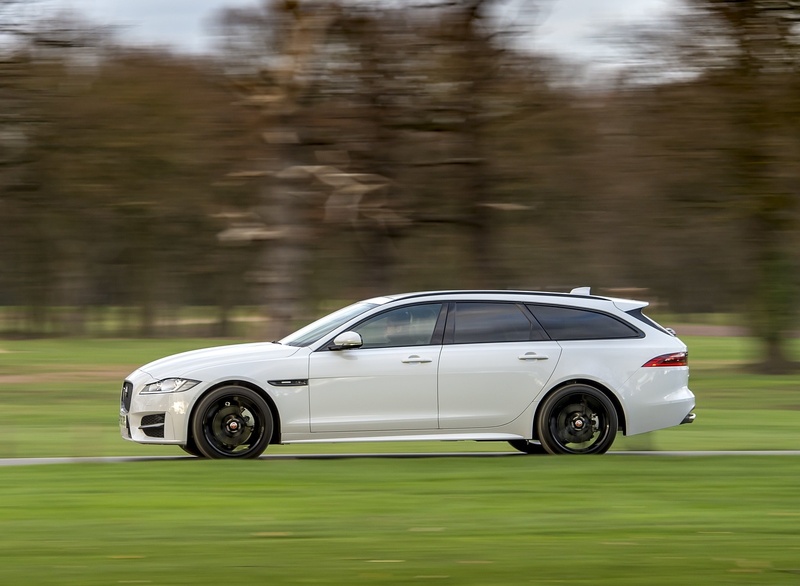 A special edition model has been added to the Jaguar XF Sportbrake line-up for 2019 model year featuring a new petrol engine. The 300 SPORT comes with a choice of Jaguar’s advanced 300PS Ingenium petrol or 300PS diesel engine, exclusive exterior design cues and a selection of unique interior design elements. 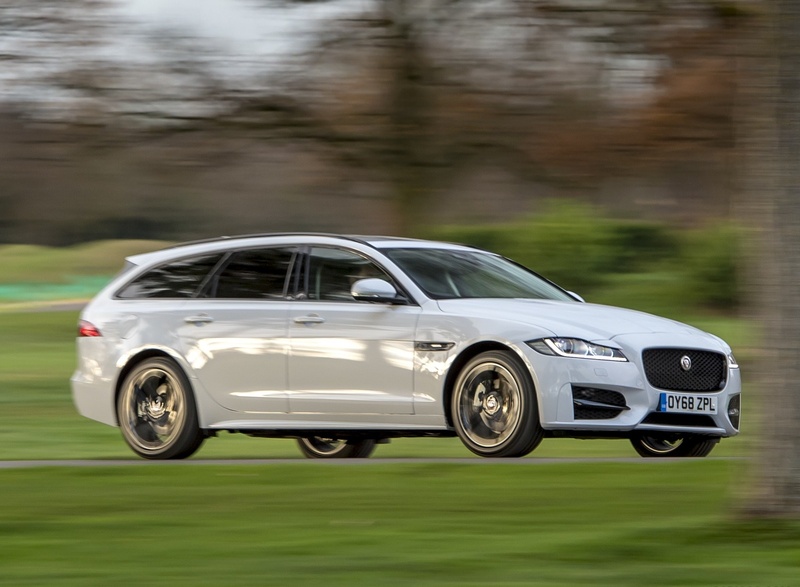 The 300PS Ingenium petrol engine makes its debut in the XF Sportbrake for 2019 model year and gives the model performance worthy of its badge. In combination with all-wheel drive, the 2.0-litre four-cylinder powerplant delivers 0-60mph in 5.7 seconds. Alternatively, the 300PS 3.0-litre TDV6 diesel provides 700Nm of torque and 0-60mph in 6.1 seconds. Additional dynamic features include unique black 300 SPORT-branded brake calipers. A series of subtle exterior design features, exclusive to the special edition, differentiate the 300 SPORT from the rest of the range. Owners can choose from three exterior colours; Yulong White, Indus Silver and Santorini Black while 300 SPORT badging on the grille and bootlid are joined by a Dark Satin Grey finish for the grille surround, side vents, mirror caps, boot spoiler and alloy wheels. As with the exterior, the interior also features a number of unique design elements. These include yellow contrast stitching on the steering wheel, instrument panel, door casings, armrest and seating. Customers will also spot 300 SPORT badging found on the front headrests, steering wheel and treadplates. 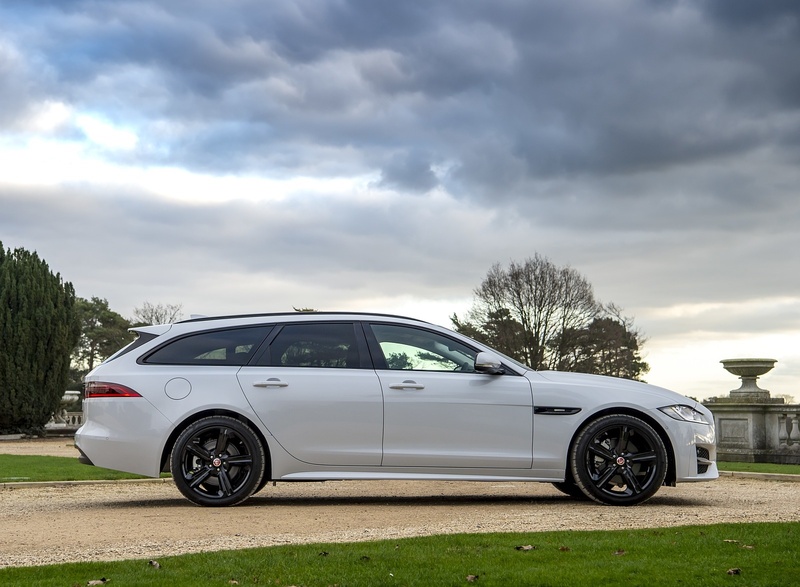 Among the changes for 2019 model year, the XF Sportbrake is fitted with Jaguar’s state-of-the-art Touch Pro infotainment system with 10-inch display as standard which delivers superior clarity, greater ease-of-use and smoother functionality. Ensuring the Jaguar XF Sportbrake’s premium estate reputation, a series of features will be standard from the new model year. These include Jaguar’s frameless Infinity Mirror with autodimming function, chrome window surrounds, chrome seat switches on seats with 10-way movement and above, premium carpet mats, suedecloth headliner, bright metal pedals and illuminated metal treadplates featuring Jaguar script. The XF Sportbrake returns Jaguar to the premium estate segment with a compelling combination of design, driving dynamics and advanced technologies that make it the standout performer. The XF Sportbrake sets high standards for practicality and convenience with user-friendly features and technologies that make every trip safer, smarter and more relaxed. Its combination of space and usability make the Sportbrake the perfect companion for customers with active lifestyles. The XF Sportbrake builds on the success of the saloon and has all of the advanced all-wheel drive (AWD) technologies and aluminium-intensive architectures that have made the XF a multi-award winner. 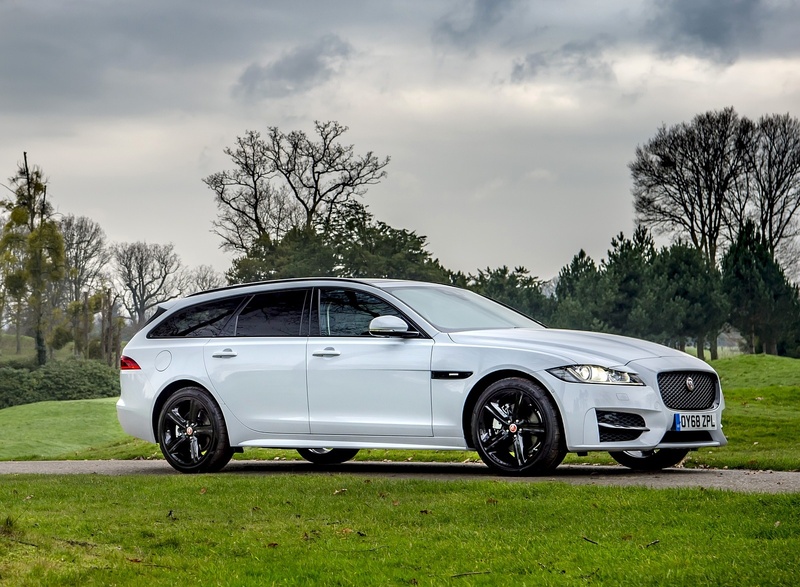 Jaguar’s family of innovative Ingenium powertrains equips the Sportbrake with the latest engine technologies. Jaguar’s optional Configurable Dynamics system, enables drivers to fine-tune settings for the steering, transmission and throttle. With Adaptive Dynamics dampers fitted, customers can also tune the suspension settings for a personalised driving experience. 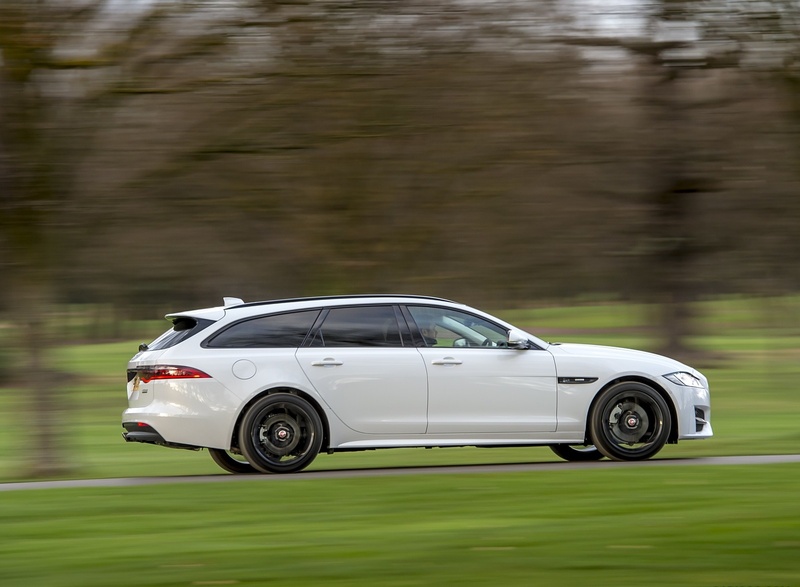 Advanced software functions developed by Jaguar, such as All Surface Progress Control (ASPC), Adaptive Surface Response (ASR) and Intelligent Driveline Dynamics (IDD) put the Sportbrake’s traction in low-grip situations and cornering ability on the same level as the saloon. 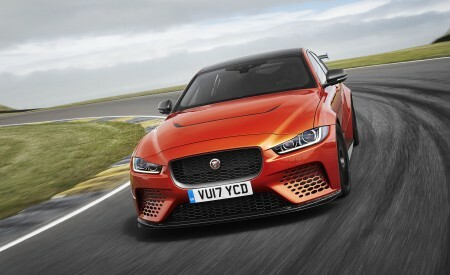 Customers looking for the ultimate confidence can choose an AWD drivetrain and Jaguar’s IDD system, which eliminates the understeer and electronic interventions that typically characterise dynamic driving in all-wheel drive models. 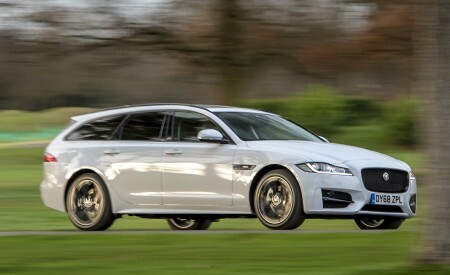 As a result, the AWD XF Sportbrake retains Jaguar’s trademark rear-wheel drive feel and agile steering responses. The XF Sportbrake continues Jaguar’s leadership in aluminium-intensive body construction to deliver a lightweight design that is both stiffer and lighter than its predecessor. Featuring an innovative single-piece polymer tailgate, the Sportbrake delivers a near perfect 50:50 front-to-rear weight distribution providing the foundations for its exceptional handling and refinement. Measuring 4,955mm, the Sportbrake is 6mm shorter than the previous model, but its wheelbase has been lengthened by 51mm to 2,960mm. This optimises rear legroom and load space and contributes to the vehicle’s refined ride quality. Aerodynamics with a drag coefficient of 0.29 contributes to CO2 emissions as low as 134g/km. Jaguar’s range of advanced four and six-cylinder petrol and diesel engines provides customary Jaguar performance, refinement and towing capacity. The range starts with a rear-wheel drive 163PS Ingenium diesel with variable geometry turbocharging that drives like a true Jaguar. The advanced powerplant delivers CO2 emissions of 134g/km with fuel efficiency of 55.4mpg (5.1 l/100km)*. The XF Sportbrake is the perfect choice for customers with active lifestyles and features a series of convenience features that enhance the practicality of Jaguar’s premium estate. 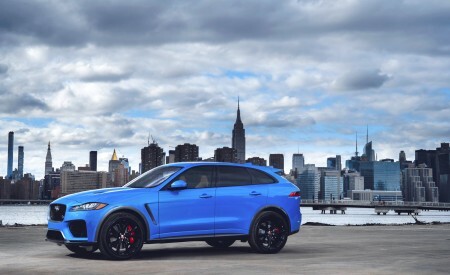 These include Tow Assist technology and Jaguar’s rugged wearable Activity Key, which lets users secure their vehicle while enjoying outdoor sports or activities without fear of losing their main key fob. Drivers are also able to set the maximum opening height for the Powered gesture tailgate to prevent damage in areas where height is restricted, such as multi-storey car parks and garages. Cabin air filtration and ionisation removes pollutants entering the vehicle, promoting health and wellness, while gesture controls for the tailgate and the sunblind for the panoramic sunroof underline the XF Sportbrake’s commitment to customer convenience. A full suite of driver assistance and safety systems is provided, bolstered by Jaguar’s Driver Condition Monitor which examines a range of inputs to detect signs of drowsiness and warn drivers when they need to take a break. 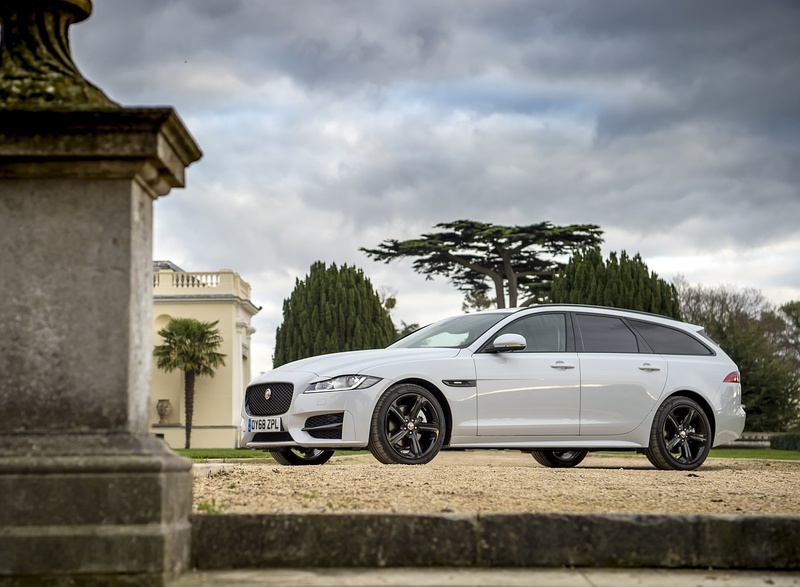 The XF Sportbrake is manufactured at Jaguar’s Castle Bromwich Plant along with the XE, XJ and F-TYPE model lines. The XF Sportbrake features familiar XF cues at the front, including full LED headlamps, but as you move towards the rear, the differences between the saloon and estate are pronounced. In profile, the slim windscreen pillars and cant rails help to deliver an elegant coupé-like impression while simultaneously optimising visibility. The strong shoulder line runs from front to rear in one unbroken line and Jaguar’s design team has used the additional volume of the premium estate’s cabin to accentuate the length, elegance and linearity of the vehicle. As a result, the XF Sportbrake looks longer than the saloon despite sharing its overall length. Providing enhanced practicality without compromising visual appeal or aerodynamic efficiency, the low-profile roof rails are capable of supporting a maximum roof load of 100kg. The chiselled rear end incorporates sleek wraparound LED taillights, which run from the body into the tailgate and incorporate the familiar half-roundel motif from Jaguar’s F-PACE sports SUV, itself inspired by the F-TYPE sports car. The linear design of the tail lamps emphasises the visual width of the rear of the vehicle and the long horizontal graphics lead the eye on a 360-degree journey around the XF Sportbrake, enhancing the impression of smoothness and serene elegance. Two solid paint colours, Fuji White and Narvik Black, are available along with eight metallic shades: Yulong White, Santorini Black, Indus Silver, Corris Grey, Loire Blue, Firenze Red, Rossello Red and Caesium Blue. In addition, a pair of premium paint options, Carpathian Grey and Silicon Silver, is provided. As part of the updates for 2019 model year, customers can choose the 300 SPORT special edition. The special model features a range of exterior design enhancements with the grille surround, side vents, side sills, mirror caps, boot spoiler, rear valance and 19 or 20-inch alloy wheels all finished in Dark Satin Grey. There is a choice of three exterior colours (Yulong White, Indus Silver and Santorini Black), and bespoke 300 SPORT badging on the grille and bootlid helps to identify this model. The interior design combines the quality and simplicity of the saloon with added space and practicality. A layered instrument panel wraps into the door panels, giving the cabin a crafted premium feel. Advanced technologies are seamlessly integrated alongside traditional features such as high quality soft grain Windsor leather trim. Customers can specify a full-colour 12.3-inch Interactive Drive Display cluster, configurable 10-colour mood lighting and 20-way adjustable seats with power headrests to provide the ultimate long-haul comfort. Further convenience features include Cabin Air Ionisation to improve the air quality and 10-inch central touchscreen as standard, while the optional soft-close doors shut with a refined and carefully engineered action, isolating occupants from the world outside. Interior space is generous both in terms of head and legroom, especially in the rear, where passengers are treated to more knee room than the original Sportbrake despite the shorter overall length. Four-zone climate control, heated seats and one of the industry’s largest panoramic sunroofs all ensure that travelling in the back of the Sportbrake is the automotive equivalent of flying business class. A gesture-controlled sunblind provides intuitive operation with a swipe of the hand enough to open or close the blind, allowing the driver to keep their eyes on the road if the fixed 1.6sq m roof is letting in too much sunshine. When retracted, the dramatic roof provides rear passengers with an uninterrupted view upwards. The 300 SPORT model features a number of exclusive interior design elements which hint at the Sportbrake’s premium and dynamic nature. There is yellow contrast stitching for the instrument panel, door casings, armrest, seating and steering wheel, while 300 SPORT badges can be found on the front seat headrests, steering wheel and treadplates. Despite the premium surroundings, Jaguar’s designers and engineers haven’t forgotten what makes premium estate models so desirable. A standard-fit 40:20:40 split folding rear seat provides flexible seating and allows customers to optimise the interior accommodation to suit the specific demands of every trip. The attention to detail inside is embodied by the location of the rear speakers, which have been relocated from the parcel shelf in the XF Saloon to the rear roof lining in the Sportbrake to provide superb interior sound quality without compromising practicality. The 565-litre boot delivers competitive luggage space with a generous 1,700 litres available when the unique rear seats are folded down, creating a practical uninterrupted flat load floor. The rear seatbacks can be released using discreet levers positioned inside the flush side panels of the boot from the rear of the car or by using controls on the seatbacks themselves. Useful features include a load cover to protect valuable items from prying eyes. The cover partially retracts automatically when the boot is opened to improve accessibility, returning to the closed position when the tailgate is shut. An optional divider net is available to restrain loose items to securing points in the roof lining. Four tie-down points allow large items to be secured inside and flush mounted rails in the boot floor accommodate a variety of optional load restraint fixings. The 40:20:40 split folding rear seat configuration is also able to accommodate two passengers in addition to longer items such as skis, using its load-through centre section. The flush sides of the load area create an impression of space that is backed up by its design. The load area has been designed to accommodate a golf bag across the width of the boot, without removing the clubs, in addition to extra items such as suitcases or holdalls. The Jaguar XF Sportbrake is highly versatile thanks to a range of thoughtful design details and innovations. Gesture controls, 40:20:40 split-folding rear seats, Cabin Air Ionisation, an Activity Key and clever Tow Assist technology all combine with a 565-litre loadspace and a towing capacity of up to 2,000kg, to make the latest addition to the Jaguar range a multi-talented proposition. 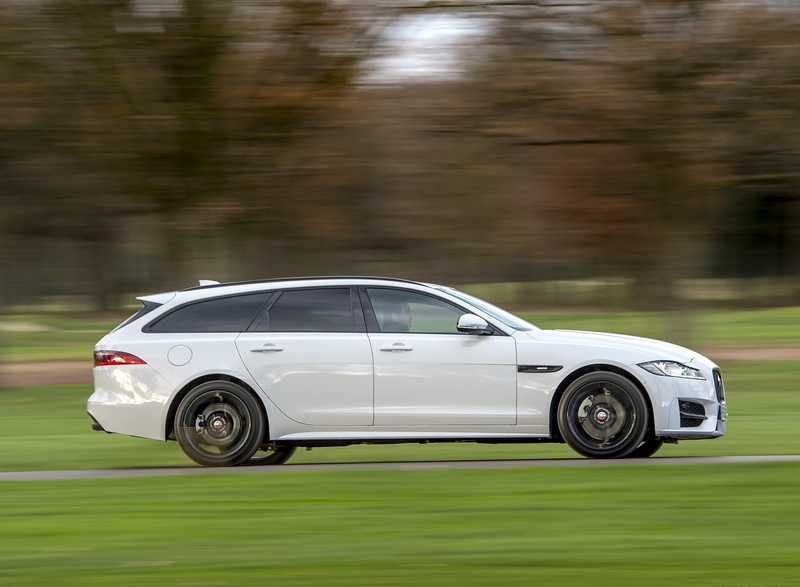 The load area has been designed to accommodate awkward loads and is even big enough to swallow a family-sized fridge-freezer while the standard-fit self-levelling rear air suspension ensure the XF Sportbrake is a highly capable tow car. The XF Sportbrake offers a Powered gesture tailgate for added convenience as an option on vehicles with keyless entry. When approaching the vehicle, customers can open and close the tailgate by waving their foot underneath the rear of the car – perfect when returning to the vehicle carrying sports gear or with hands full of shopping bags. Motion sensors on either side of the lower bumper detect the movement and, if the security system detects the key within a metre of the tailgate, unlocks and opens the vehicle. The same action can then be used to close the tailgate once luggage has been safely stowed. On vehicles equipped with the panoramic roof, customers will also be able to choose Gesture controlled sunblind. All that’s required to open or close the sunblind is a simple swipe of the hand forwards or rearwards in the space behind the interior rear view mirror. This intuitive and button-free technology makes operation simple, logical and distraction-free for drivers. The towing capacity of the XF Sportbrake ranges from 1,900kg for the 250PS petrol engine to 2,000kg for all other powertrains. Towing options include an electrically deployable 50mm tow ball with nose weight calibration that can be operated from the cabin and enables the customer to check the lights on the trailer, as well as a manually detachable 50mm tow ball. Jaguar’s Tow Assist stability control system is standard on all models and automatically helps to prevent trailer sway without any intervention from the driver. The XF Sportbrake is available with Jaguar’s wearable Activity Key technology. The waterproof, shockproof rubberised wristband features an integrated transponder to support active lifestyles by allowing owners to lock their conventional key fob inside the vehicle while they enjoy outdoor pursuits and activities wearing the advanced wristband. The XF Sportbrake also includes a cabin air purification system for the first time. The technology provides protection against environmental pollution, enhances the cabin ambiance and promotes customer well-being. The system purifies the air, neutralising odours and removing bacteria by releasing fine e-ion charged particles into the air stream. Nanoe™ technology enhances the well-being of both driver and passengers alike. It improves the air quality within the vehicle cabin by removing allergens, viruses, airborne bacteria and associated odours. It does so by ionising particles in the air, making them attract to and neutralise the air contaminants. It can be switched on or off. 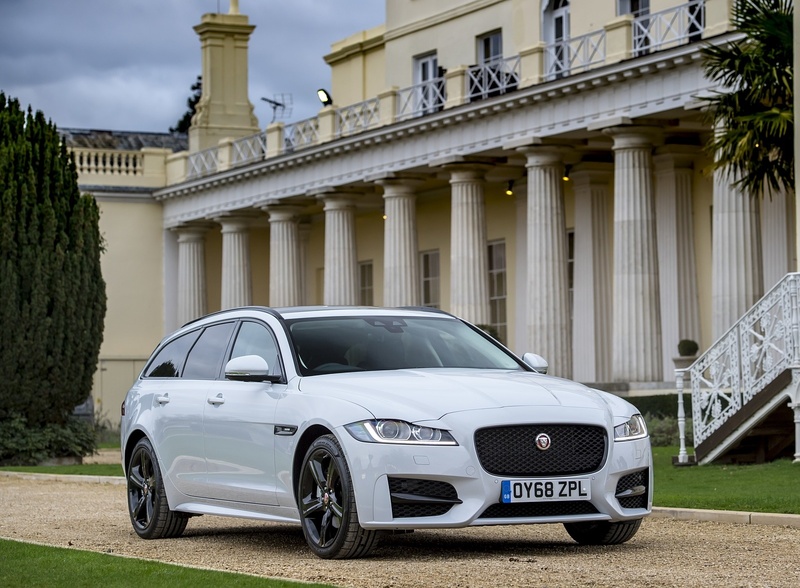 Jaguar has developed a range of bespoke accessories for the XF Sportbrake to help customers personalise their vehicle and make full use of the sport estate’s versatile design. Styling enhancements range from carbon fibre accessories for the exterior, to personalised treadplates on the inside while the host of practical additions includes easy-to-fit cross bars for the low profile roof rails and a comprehensive range of load space mats and liners. A maximum roof payload of 100kg allows customers to make the most of the vast array of roof accessories, which include a practical 320-litre luggage box. In keeping with the premium lifestyle estate’s flexible design, Jaguar offers a choice of ski and snow board holders (four pairs of skis or two boards), cycle racks (maximum of three bikes, fork mounted) and watersports carriers for roof mounting. Alternatively, cyclists can mount up to three bikes on a specially developed tow bar-mounted cycle carrier with a clever quick release and secure locking mechanism. Inside, the comprehensive range of accessories includes a full-height dog guard, which secures to specially-located fixing points in the rear of the vehicle, and boot liners with fold out bumper protectors to preserve the appearance of the rear bumper when loading and unloading. An array of advanced chassis technologies ensures the Jaguar XF Sportbrake is an engaging choice in its class. With its core dynamic architecture proven in the XF sports saloon, the addition of adaptive technologies and intelligent functions ensure its exceptional practicality is matched only by its sports car-inspired dynamics and trademark Jaguar composure. 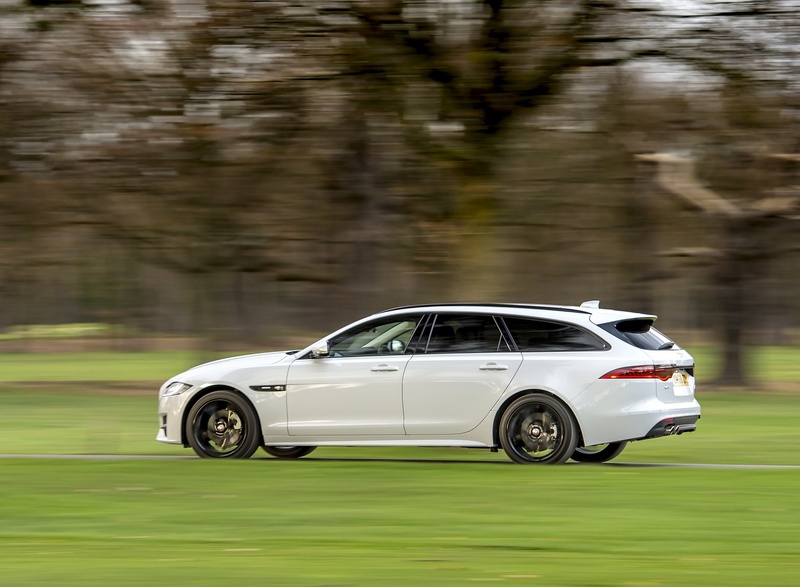 The Jaguar XF Sportbrake’s near-perfect 50:50 weight balance was the starting point for the development of a chassis system that feels taut, agile and responsive. 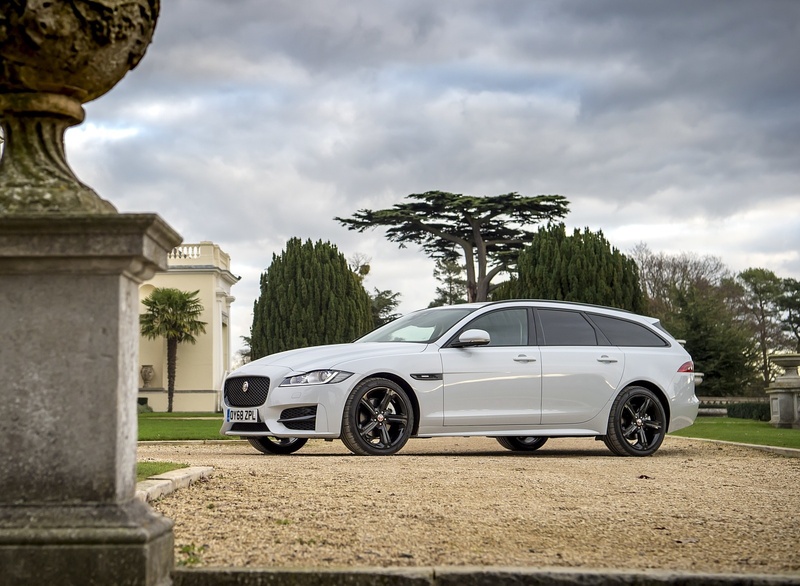 To optimise the existing XF underpinnings to suit the additional luggage capacity of the Sportbrake, Jaguar’s engineers examined every aspect of the estate. The electric power assisted steering (EPAS) system has been optimised to enhance the driving experience with a faster steering ratio than before, making the vehicle more relaxing to drive and effortlessly responsive. The Sportbrake’s front suspension set-up is extremely light and stiff to create the best possible turn-in response. Extensive use of lightweight aluminium alloy components, advanced production processes and design techniques help to deliver characteristically engaging handling responses and agility. The revised front set-up uses double-wishbone architecture with a front knuckle produced using Jaguar’s patented Cobra Press process. The lower control arms are forged aluminium alloy with low-mass springs, bushes and anti-roll bar all helping reduce weight and enhance performance and efficiency. In addition, the integration of composite air scoops to channel airflow directly onto the brake discs enhances stopping power during dynamic driving. To ensure the XF Sportbrake’s ride comfort is a match for the saloon, Jaguar’s ride and handling experts have made subtle changes to the front dampers. A by-pass valve system provides primary ride comfort in normal driving. In more dynamic conditions, the valve shuts to stiffen the damper settings and sharpen handling responses. At the rear, the Sportbrake’s sure-footed handling and load carrying strength is assured with a fully air sprung rear suspension set-up fitted across the range as standard. Replacing the saloon’s steel coils with self-levelling air springs ensures the XF Sportbrake remains composed whatever it is carrying. The Sportbrake otherwise retains the XF saloon’s acclaimed rear set-up, with the same integral rear link suspension system and bushes delivering exceptional driving dynamics and ride comfort. Jaguar’s optional adaptive damper technology makes driving the XF Sportbrake even more rewarding, with heightened composure and comfort providing an outstanding driving experience. In Dynamic Mode, the adaptive damping tightens body control, sharpening the car’s responses and unlocking its true cornering capability. The result is exceptional handling with the feedback, composure and high-speed stability drivers expect from a sporting Jaguar. The XF Sportbrake features Jaguar’s Configurable Dynamics package as an option on all models fitted with automatic transmissions. Proven in the F-TYPE sports car, the three-way system allows drivers to adjust the steering settings, throttle map and gearshift modes. When the adaptive damping system is also specified, Configurable Dynamics with Adaptive Dynamics adds custom suspension settings to the XF Sportbrake’s Dynamic mode. In addition, when fitted in conjunction with the Touch Pro infotainment system, Configurable Dynamics introduces ‘Dynamic-i’ mode to the central touchscreen menus, with a stopwatch and dynamic g-force display available. 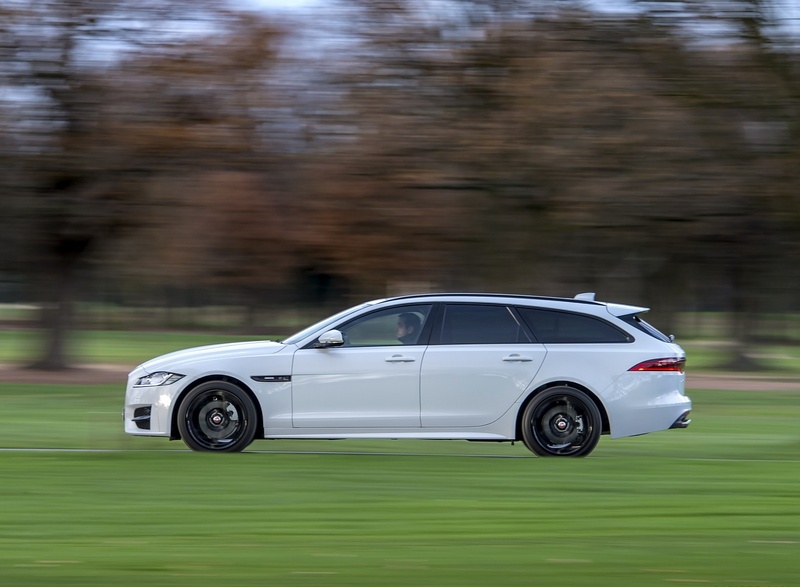 For drivers choosing all-wheel drive (AWD), the XF Sportbrake incorporates Intelligent Driveline Dynamics (IDD), which uses sensors to actively predict rear wheel slip and redistribute torque to prevent loss of traction. 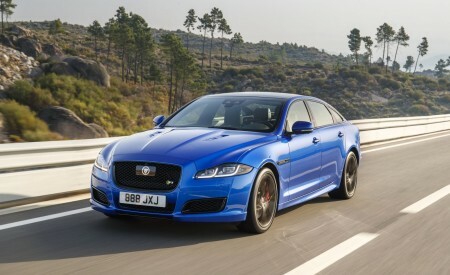 All-wheel drive models also have the additional assurance of advanced traction functions developed by Jaguar. All Surface Progress Control (ASPC) and Adaptive Surface Response (AdSR) help drivers to cope in low-grip conditions, such as on icy roads or wet grass. The semi-autonomous ASPC function is fitted to all automatic derivatives as standard and operates as a low-speed cruise control system. In low-grip conditions, the technology can help drivers to pull away safely from a standstill to speeds of up to 30km/h (19mph). The driver controls the desired speed using the cruise control switchgear, with no need to touch the pedals. The technology manages the power and traction aids to exploit whatever grip is available, leaving the driver to focus solely on steering the vehicle. 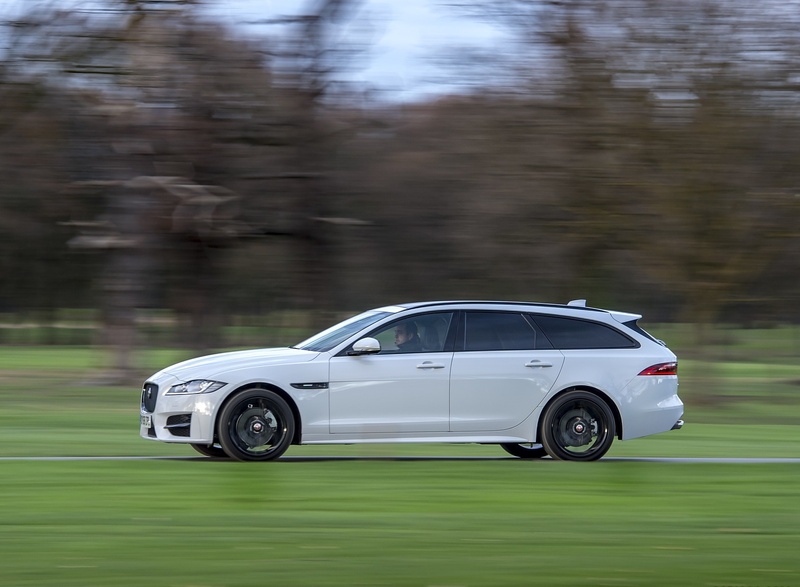 The Jaguar XF Sportbrake features an intelligent AWD system to deliver unsurpassed dynamics and traction without diminishing the rear-wheel drive characteristics associated with Jaguar models. The AWD system’s hardware is lighter, more responsive, powerful and efficient than its predecessor, weighing just 20.5kg and reacting in less than 250ms to changes in the driving conditions. Applying Jaguar Land Rover’s unrivalled AWD expertise, the system works in association with Intelligent Driveline Dynamics (IDD) to virtually eliminate understeer and reduce the likelihood of Dynamic Stability Control (DSC) intervention. In fast corners, the IDD’s torque shift capability works with other traction systems such as DSC and Torque Vectoring to help mitigate oversteer through yaw damping. As a result, drivers can enter curves at higher speeds and accelerate sooner on exit, all the while retaining Jaguar’s customary handling. As the XF Sportbrake exits a corner, IDD creates near perfect 50:50 torque distribution for maximum grip and optimum acceleration. 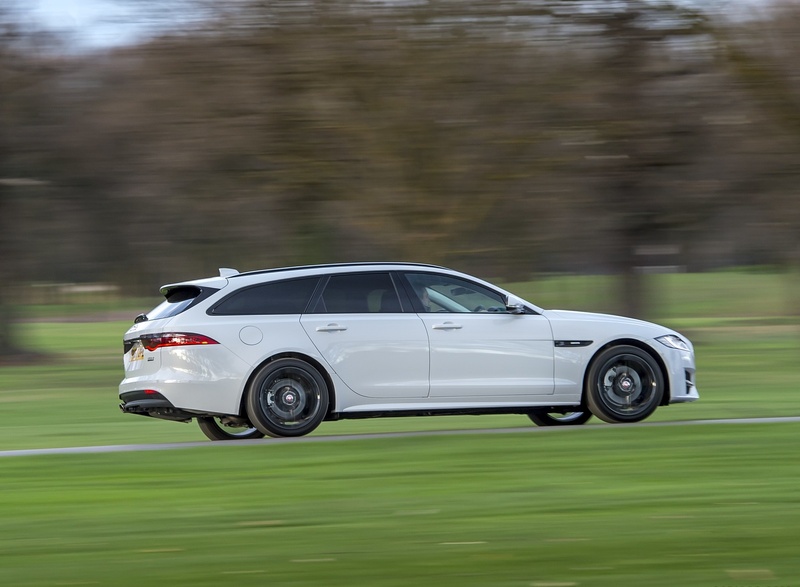 The Jaguar XF Sportbrake’s aluminium-intensive lightweight body structure is stiff, strong and designed to deliver a near perfect 50:50 weight balance with superb agility. Jaguar’s experience in lightweight materials also helps reduce CO2 emissions and improve fuel efficiency by its contribution to reducing overall vehicle mass. The Sportbrake features a rear body structure that continues the evolution of Jaguar’s Lightweight Aluminium Intensive Architecture. The body uses a combination of specially developed high-strength and lightweight aluminium alloys, with magnesium used for the cross-car beam to optimise weight in this key area. Jaguar’s design also uses steel alloys in strategic areas such as the rear floor, doors and B-pillars. This intelligent combination of materials not only increases impact strength; it also distributes weight evenly between the front and rear axles, providing the balance that underpins the XF Sportbrake’s ride and handling. The addition of a single-piece polymer tailgate with a bonded rear window further enhances the Sportbrake’s balance, lightness and agility. Jaguar’s engineers looked for every opportunity to optimise weight and performance when developing the Sportbrake from the XF sports saloon. For example, the use of a high-strength alloy for the Sportbrake’s body sides made it possible to produce panels in 1.1mm panel thickness, providing the same strength and durability with less mass. A spray-on, high-density damping material also replaced conventional acoustic insulation pads, further reducing weight. Particular attention was paid to the Sportbrake’s suspension to achieve the lowest possible weight and maximum stiffness. The front shock towers are cast aluminium alloy, while the rear lower arms are hollow cast to save weight. Other weight-saving innovations include a hollow front anti-roll bar, optimised passive dampers and thinner, higher-stress suspension coil springs. The XF Sportbrake’s engines are characterised by their swift torque delivery and effortless acceleration, their smooth and immediate throttle response and unmistakable soundtrack. All feature fuel-saving stop-start systems (market dependent) and smart regenerative charging to optimise efficiency. Pairing the XF Sportbrake’s lightweight aluminium-intensive body with the all-aluminium Ingenium engine family has set strong benchmarks for performance and refinement. From the 163PS 2.0-litre Ingenium diesel, with its CO2 output of 134g/km and six-speed manual transmission, to the 300PS four-cylinder Ingenium engine, via an eight-speed automatic, the XF Sportbrake delivers a compelling mixture of performance and refinement. Designed, developed and manufactured in the UK, Ingenium is a world-class family of advanced four-cylinder diesel and petrol engines. The diesel range includes three 2.0-litre engines and a phenomenal 3.0-litre V6 with twin sequential turbocharging. The 2.0-litre four-cylinder Ingenium diesel is available in the following power/torque combinations: 163PS/380Nm; 180PS/430Nm; 240PS/500Nm . The advanced four-cylinder engines use state-of-the-art Selective Catalytic Reduction (SCR) to achieve Euro 6d-T compliant NOx emissions. Jaguar’s TDV6 diesel delivers exceptional power and torque outputs of 300PS and 700Nm respectively – enough to power the premium sports estate from 0-100km/h in 6.6 seconds (0-60mph in 6.1 seconds) while returning fuel efficiency of 46.3mpg (6.1l/100km) and CO2 emissions of 160g/km. The assured performance and excellent economy of the V6 diesel derives from its use of twin sequential turbochargers. The first boosts the engine’s low-end responses before the second turbo spools up to provide a continuous flow of power across the rest of the rev range. The turbocharger vanes, compressor wheels and ceramic bearings are designed to reduce internal friction, enabling the V6 to build torque faster – further enhancing the engine’s responses. Mated to the eight-speed automatic transmission, the V6 diesel’s phenomenal 700Nm of torque produces exceptional performance, whether you are tackling a challenging road, carrying a heavy load or towing a trailer. Customers also have a choice of three powerful petrol engines, in both rear-wheel drive and all-wheel drive configurations. 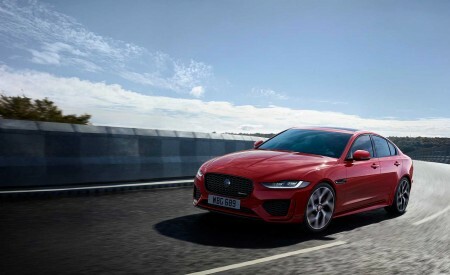 Jaguar’s 2.0-litre four-cylinder Ingenium engine is available in 250PS form and, new for 2019 model year, in 300PS form. The 250PS, with rear-wheel drive, produces 365Nm of torque, delivering CO2 emissions of 173g/km and fuel economy of up to 37.2mpg (7.6l/100km). Meanwhile, the new 300PS version, with all-wheel drive, produces 400Nm of torque with fuel economy of up to 36.2mpg (7.8/100km) and CO2 emissions of 178g/km. This enhanced power also helps to deliver a 0-100km/h time of 6.0 seconds (0-60mph in 5.7 seconds). 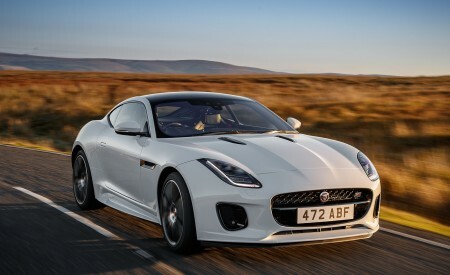 Shared with Jaguar’s F-TYPE sports car, this high-performance engine combines twin-vortex supercharging technology with direct injection and dual independent variable cam timing on both the intake and exhaust valves. 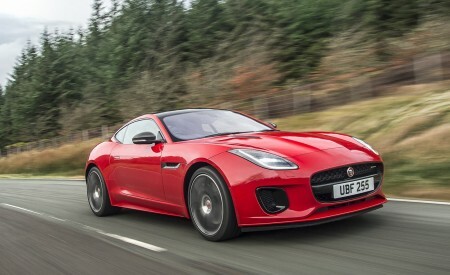 The result is great throttle response, relentless power delivery and a familiar Jaguar soundtrack. The twin-vortex supercharger promises thrilling performance and refinement at lower speeds and a substantial increase in top-end power delivery. 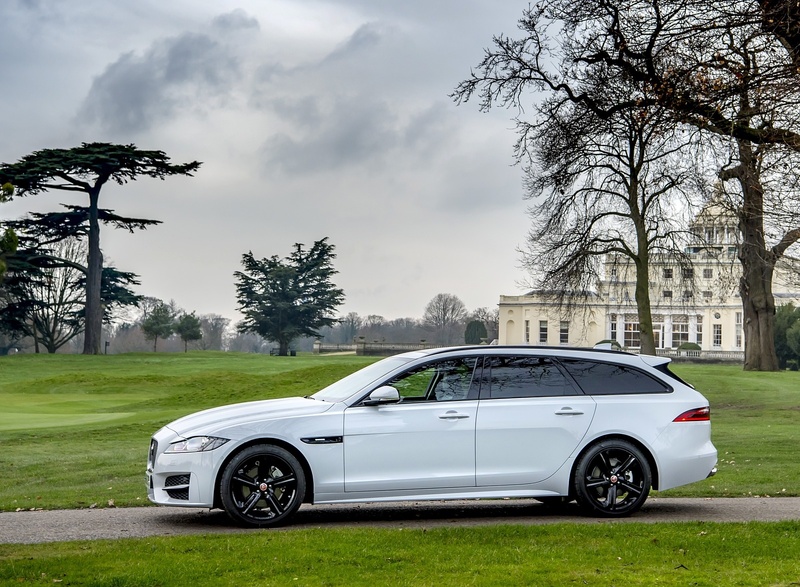 The supercharged V6 is reserved exclusively for the Jaguar XF Sportbrake S. Paired with the eight-speed automatic transmission and Jaguar’s AWD system, the Sportbrake S accelerates from 0-100km/h in 5.5 seconds (0-60mph in 5.3 seconds) and maximum speed is electronically limited to 155mph (250km/h). The automatic transmission provides smooth launches with seamless shifting. The transmission controller is networked with the Jaguar Drive Control, offering even faster shifts and a more responsive kickdown in Dynamic mode, and earlier up-shifts in Eco mode. The manual six-speed gearbox sets the standard for shift quality and efficiency. Every detail of the design is optimised to improve feel and provide smoother, more precise gear changes. The transmission’s aluminium alloy casing, hollow shafts and pocketed gears make it lighter, while an innovative semi-dry lubrication system improves its internal efficiency. For 2019 model year the XF Sportbrake offers Touch Pro with the enhanced 10-inch touchscreen as standard across the line-up. Touch Pro premium infotainment is an in-house development that takes the Jaguar XF Sportbrake’s multimedia experience to another level. With a large 10-inch touchscreen and Jaguar’s optional Dual View technology, the driver can view essential vehicle information on the central screen, while the front seat passenger simultaneously accesses multimedia content using the same screen. The touchscreen features a clear, intuitive user interface designed to give quick, easy access to all features and functions. An updated voice control engine makes the system even simpler. Users can customise the home screen in the same way as their smartphone, setting wallpaper images, adding shortcuts to favourite features and even adding extra home screens. The technology also enables the driver to pinch and zoom just as they would on a smartphone. Touch Pro’s navigation system integrates vehicle data up to 40 times a second so, even when the GPS signal drops in coverage black spots like built-up city centres, the vehicle is accurately positioned on the map. More advanced functions provide location-based features and information. Door-to-door route planning and guidance is able to incorporate public transport options, while Commute Mode learns your daily drive, and automatically offers alternative routes to beat congestion based on real-time traffic information. Arrival Mode brings up a 360-degree interactive view of your destination in the final 200m, even advising on available parking spaces nearby. Touch Pro makes more of music collections with functions such as ‘Play more like this’. Jaguar XF Sportbrake also offers audiophiles the option of a 17-speaker, 825W Surround Sound System developed with audio experts Meridian that delivers incredible sound reproduction with near-zero levels of distortion. Dialling-in to a conference call, booking a hotel room or just catching up with the news – with InControl Apps the XF Sportbrake ensures drivers can connect Apple and Android smartphones to the car. Via a USB cable and the dedicated port in the centre console, InControl Apps provides access to compatible apps stored on the device using the vehicle’s central touchscreen. Remote Essentials functionality, accessed through the Remote app, enables customers to interact with the XF Sportbrake from anywhere using a smartphone. It can display how much fuel is in the tank, whether the doors are locked and if the windows have been left open. There’s even the option to download mileages from business trips to make claiming expenses quicker and easier. Remote Premium (also accessed using the Remote app) does even more, enabling the driver to remotely lock or unlock the car and receive alerts if the alarm sounds, with the option to reset it. A beep and flash feature can help drivers to find the car if they’ve forgotten where they parked it – perfect for busy car parks or crowded city streets – or there’s a map to lead them straight to it. For the last word in comfort and convenience, Remote Premium enables the driver to bring the cabin to a pre-set temperature by remotely starting the engine. On most models equipped with automatic transmissions, a press of a smartphone button is all it takes for the Sportbrake’s highly effective climate control system to heat or cool the interior to the desired temperature before a journey – perfect for hot summer afternoons or freezing winter mornings. Secure Tracker enhances security by providing proactive vehicle monitoring. Should the XF Sportbrake be stolen, the tracking service will work with law enforcement agencies to locate and recover the car as quickly as possible. This includes service subscription for the warranty period. The Jaguar XF Sportbrake features an array of advanced driver assistance systems, which have all been optimised specifically for the Sportbrake, including a forward-facing stereo camera that generates an accurate 3D image of the road ahead. Jaguar’s state-of-the-art sensor and image processing software provides Autonomous Emergency Braking, Lane Departure Warning and Lane Keep Assist, which all significantly reduce the potential risk of collision. Driver Condition Monitor tracks the vehicle’s position in its lane, the driver’s steering inputs and interactions with other vehicle systems to recognise behaviour patterns that indicate signs of driver fatigue or inattentiveness. Visual warnings in the instrument panel alert the driver and prompt them to take a break when signs of tiredness are detected. Further driver support comes from a Traffic Sign Recognition system that keeps the driver informed of speed limits – including temporary limits in force for road works or on motorways. The Sportbrake’s software crosschecks camera data with its onboard navigation database for the highest possible accuracy. If the driver chooses, a warning function can provide alerts whenever the speed limit is exceeded. 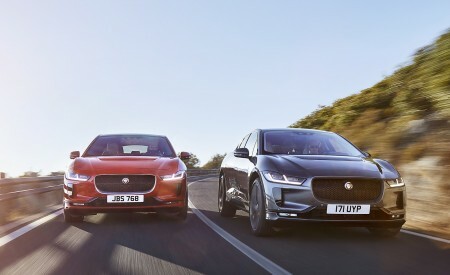 Jaguar has also developed an Adaptive Speed Limiter that works with the Traffic Sign Recognition, to help regulate vehicle speed by automatically accelerating or slowing down when a change in speed limit is detected using engine braking. The Sportbrake’s Adaptive Cruise Control (ACC) system helps to remove the stress from driving in heavy traffic. A long-range 77GHz scanning radar enables the vehicle to maintain a safe distance from the car in front, even when the traffic comes to a standstill. When things start moving again, its Queue Assist function enables the XF Sportbrake to move off again when the driver just touches the accelerator pedal, tracking the vehicle in front. Onboard radar sensors enable Blind Spot Monitor technology which scans the area behind the XF Sportbrake. The system tracks vehicles approaching from behind. Once fast-moving vehicles reach within 80m, the system alerts the driver. As they approach the blind spot, an icon flashes in the side mirror as a warning. Once the vehicle enters the blind spot, the icon lights up solidly. If the driver attempts to change lane, the Blind Spot Assist function (an optional upgrade on Blind Spot Monitor) will apply corrective torque to the steering wheel, encouraging you to guide your vehicle away from the approaching vehicle. Backing out of parking spaces can be made even safer with the Reverse Traffic Detection system. The sensors used in the Blind Spot Monitoring system will detect approaching vehicles which may be unseen by the driver and can trigger an alert. A range of semi-automated Park Assist functions for both bay and parallel parking manoeuvres make the XF Sportbrake easy to manoeuvre, even in crowded areas. Ultrasonic sensors measure spaces and steer the car into position, with the driver simply operating the accelerator and brakes as the vehicle automatically steers itself into position. The system can also steer the vehicle out of tight parallel parking situations. A 360º Surround Camera complements the XF Sportbrake’s assist functions perfectly. With images from four cameras combining to create a 360-degree view around the car, manoeuvring has never been safer or easier.